Real marine art, watch out for updates, by Gordon Frickers. 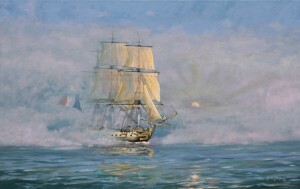 There is more to the title of this painting which refers to the frigate ‘Hermione’ emerging from fog, than meets the eye. For a start, the painting has surprised me by setting a personal best as my most ‘liked’ painting to appear on Facebook. 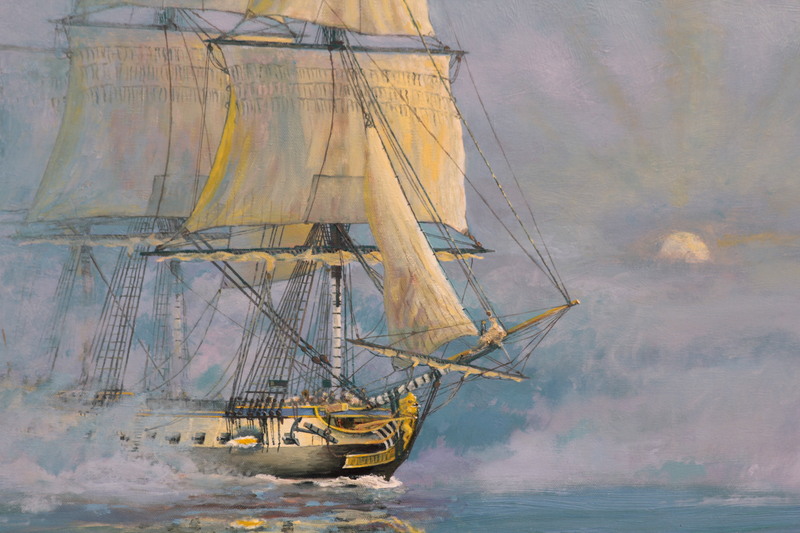 Having painted a scene with the original ‘Hermione’ this piece makes a modern running mate, a pair, representing the story of the original Concord class frigate and today’s magnificent replica frigate completed recently at Rochefort sur mer near La Rochelle. 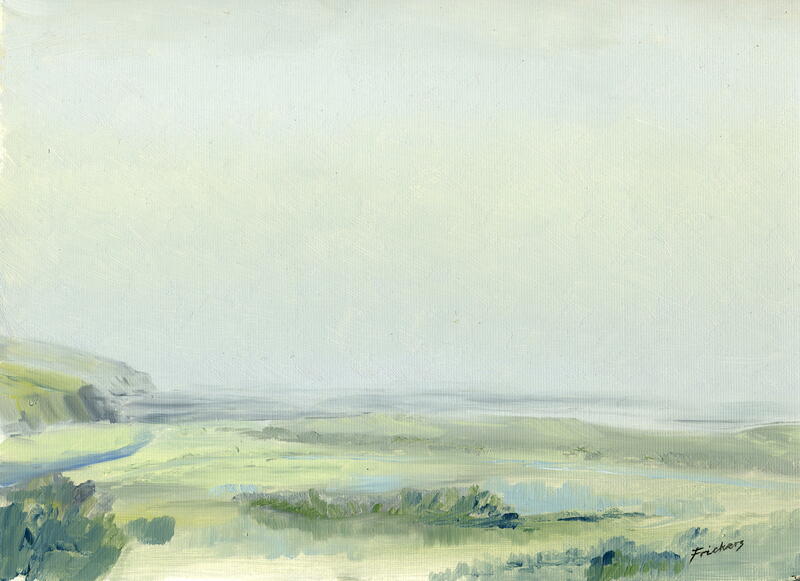 I have painted the subtleties of mysterious fog many times, sometimes on location, in particular during the best days of my life (so far) when I lived behind a beach overlooking the beautiful Saint Austell Bay, I still have a few of those studies, here is a favourite of mine, painted from what was my studio window. 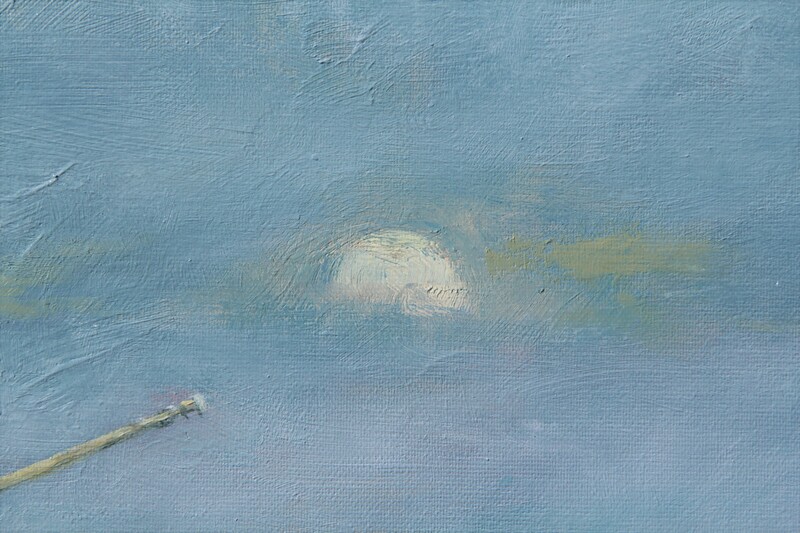 In common with most sailors, I have sailed, navigated, in sea fog many times thus there is a wealth of experience in the form and colours of this atmospheric, emotional painting, for you to discover and enjoy. Having painted a scene with the original ‘Hermione‘ this piece makes a modern running mate, a pair, representing the magnificent replica frigate built completed recently at Rochefort sur mer near La Rochelle. The new Hermione is a huge success helping attract artisans from all over Europe, millions of visitors and world wide publicity, revitalising what was the dying town of Rochefort sur mer, I sincerely salute the many brave, visionary people associated with the project and wish ‘The Harwich Mayflower Project’ similar good fortune. 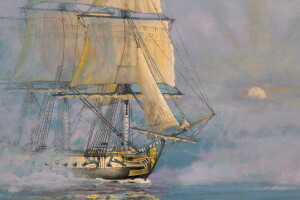 This second ‘Further Reading (2) ‘ link helps you discover the story of the original French Frigate Hermione, her place in history and introduces my companion painting of the original ship which took a very active role in the American War of Independence including conveying the French General la Fayette and escorting his fleet, stores and troops. Hermione was built at la Corderie Royal, Rochefort sur mer. She is a near exact copy with allowance made for modern ‘safety requirements’, auxiliary engine etc of the Concord class frégate Hermione built 1779 at the l’arsenal de Rochefort.